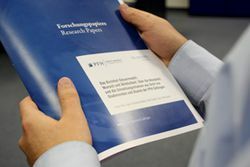 With the series "PFH Forschungspapiere/Research Papers", the University communicates the results of its research activities in chronological order. This series is complemented by the Scientific Studies. Large-Scale Transition of Economic Systems – Do CEECs Converge Towards Western Prototypes? The state and islam in central asia: Administering the Religious Threat or Engaging Muslim Communities? A liberal developmental state in Georgia? State dominance and Washington Consensus in the post-communist region. Unabhängige Organisationen in autoritären Regimes: Widerspruch in sich oder effektives Instrument von Developmental States? Predictive Markets: Ein vielversprechender Weg zur Verbesserung der Prognosequalität im Unternehmen? Crowdinvesting – eine Alternative in der Gründungsfinanzierung? Economic reform and institutional change in Central Asia: towards a new model of the developmental state? Bericht zur Studie "Arbeitswelten 2020"
Behavioral Targeting – ein effizienter Einsatz des Online-Werbebudgets? Nischenartikel – Wachstumstreiber für den Versandhandel? Adaptive Efficiency: Can it Explain Institutional Change in Korea’s Upstream Innovation Governance? Analyzing Bottlenecks for Institutional Development in Central Asia - Is it Oil, Aid, or Geography? Is Russia winning in Central-Asia?